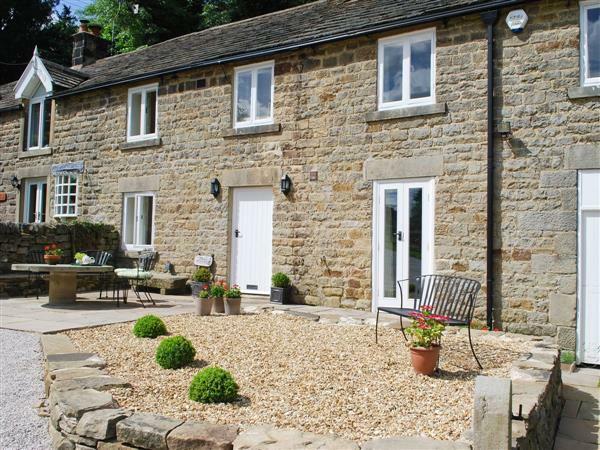 Bank Cottage in Grindleford, Derbyshire sleeps 6 people. This delightful holiday cottage, one of a row, has been totally refurbished, yet retains the original character. Situated in an elevated position, offering stunning views across the countryside, it is located in the village of Grindleford, with the local pub just a short stroll down the lane and plenty of walks from the door. Within a few miles of Hathersage, with its open air swimming pool, the market town of Bakewell, Chatsworth, Haddon Hall and the plague village of Eyam. Shop ¼ mile, pub 200 yards. Living room with electric ‘wood burner’, tiled floor and French doors. Dining room. Well-equipped Shaker-style kitchen with tiled floor. Separate toilet. First floor: Double bedroom with 5ft bed and en-suite shower room with toilet. Double bedroom. Twin bedroom. All bedrooms with beams and original wooden floors. Bathroom with separate shower cubicle and toilet. Bank Cottage is in South Yorkshire; should you be on the lookout for a special offer, you can find all the special offers in South Yorkshire. It's always worth checking to see what is on offer at the moment. Do you want to holiday near Bank Cottage (RCCR), you can see other cottages within 25 miles of Bank Cottage; have a look to find your perfect holiday location.